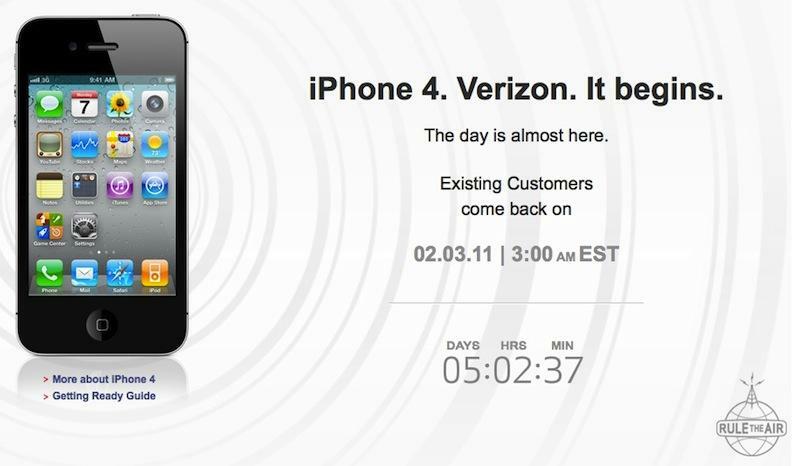 With less than a week to go before preorders for Apple's iPhone 4 on Verizon commence, the carrier has launched a new teaser countdown page for existing customers, telling them to come back at 3 a.m. Eastern on Feb. 3. Though Verizon sent out emails to business customers earlier this week notifying them of the 3 a.m. start, the new page is the first time that all existing customers were informed of the time. Verizon customers will, of course, still need to check with the carrier to verify that they are eligible for an iPhone upgrade. Verizon's iPhone frequently asked questions page still states that preorders will begin "on or around February 3rd 2011" and will be sold on a "first come, first serve" basis. While a 3 a.m. Eastern time may seem an odd time for Verizon to begin taking iPhone 4 preorders, it's the earliest time where all contiguous states will have reached Feb. 3. The 16GB iPhone 4 model will cost $199, while the 32GB model will cost $299, each with a 2-year contract. A leak on the Apple website Wednesday revealed that Verizon's voice plans for the iPhone 4 will start at $39.99 per month, with unlimited data for $29.99, and the option of 2GB of data tethering for an additional $20. According to one Verizon executive, the company's unlimited data plan will only be available for a limited time before being phased out for a tiered pricing structure. After years of speculation and rumors, Apple's successful smartphone officially goes on sale through Verizon on Feb. 10. In preparation for the launch, Verizon has also begun carrying cases for the CDMA iPhone 4 on its website. Apple recently began offering a universal bumper case that fits both the GSM and CDMA models of the iPhone 4, since the new CDMA iPhone has a new antenna design that necessitated moving the mute switch slightly. Verizon Chief Financial Officer Francis Shammo told investors Tuesday that the carrier has invested significant resources into the long-awaited launch of the iPhone. "We are not going to have any flaws on the execution of the iPhone launch," he said.